Best Glue Ever IS the Best Glue EVER!!! If you haven’t guessed by now, I LOVE to chat! And often while gesticulating with my hands! And most likely when I’m supposed to be gluing something down…. The Best Glue Ever doesn’t dry…it just gets stickier! Which is PERFECT for me! I can chat, apply some glue… chat some more… apply some glue…go answer the phone (you know it happens! )… and then attach my die-cut to my card without worrying that it won’t stick! LOVE LOVE LOVE IT! 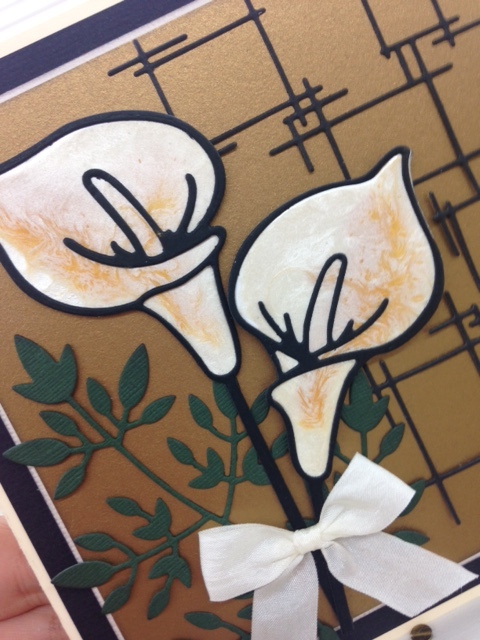 This card that I created for a class, is the PERFECT example of using my Best Glue Ever to it’s full advantage…the background die is “Stick Frames” by Memory Box, the greenery is “Freida Leaf” also by Memory Box, and the Calla Lily (my FAVOURITE!!) is by Dee’s Dystinctively…This die has the solid Calla background Die, as well as the outline, so you can create a huge assortment of effects! 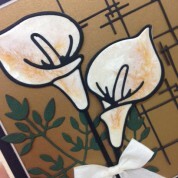 On these Lilies I used Pebeo‘s Prisme and Moon Fantasy Paints, and when the panels dried, I attached the Lily outlines with…Best Glue Ever! And for this project, I used the Best Glue Ever WITHOUT the fine tip attachment…what’s a “fine Tip Attachment” you ask…well, that is for ANOTHER blog post! This entry was posted in Product Descriptions and tagged Best Glue Ever, card, Dee's Distinctively, Jessie Hurley, Memory Box, Pebeo Moon, Pebeo Prisme, Scraperfect, technique. Bookmark the permalink.